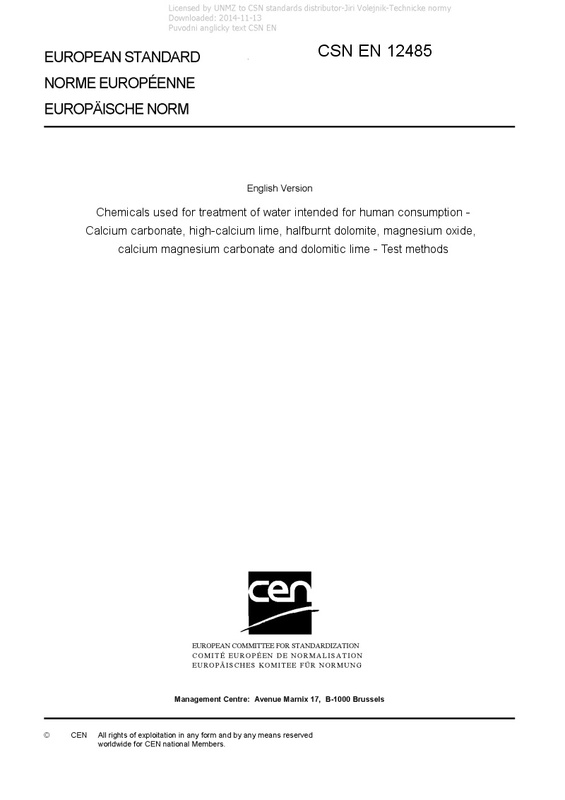 EN 12485 Chemicals used for treatment of water intended for human consumption - Calcium carbonate, high-calcium lime, halfburnt dolomite, magnesium oxide, calcium magnesium carbonate and dolomitic lime - Test methods - This European Standard specifies the methods used for the chemical analyses and the determination of physical properties of calcium carbonate, high-calcium lime, half-burnt dolomite, magnesium oxide, calcium magnesium carbonate and dolomitic lime used to treat water for human consumption. This document specifies the reference methods and, in certain cases, an alternative method which can be considered to be equivalent. Any other methods may be used provided they are calibrated, either against the reference methods or against internationally accepted reference materials, in order to demonstrate their equivalence.